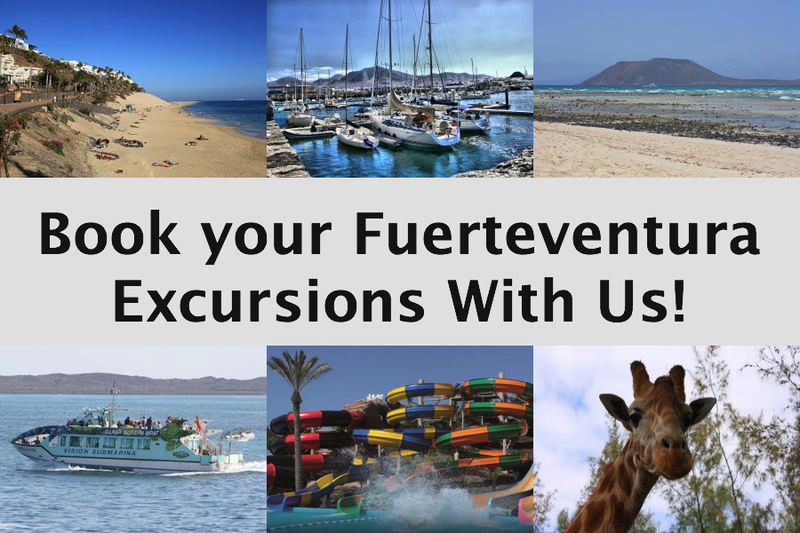 Let us book your excursions in Fuerteventura! This will save you time and it will allow you to budget for your holiday in advance. Explore the biggest tropical vegetation oasis in Europe and get up close and personal with over 3000 animals of 250 different species. There is even free transport from the main resorts on the island! Enjoy contact with the animals, an environmental tour of the park and create memories of a lifetime. Oasis Park is also the largest camel reserve in Europe and the only Majorero camel reserve in the world! The park boasts great restaurants which serve typical Canarian cuisine as well as international food. There is also a children’s playground and farm where children can experience direct contact with some of the animals. The park caters for the elderly & disabled with adapted facilities and resting areas throughout. Enjoy secluded swimming areas, take part in water sports activities and visit areas of the island that are less easy to access for the general public on this brilliant boat excursion. Your day will start by being picked up from your resort and being taken to the port of Corralejo where you will board Celia Cruz. The catamaran will head to Papagayo Beach in Lanzarote, allowing you to enjoy free time swimming and taking part in some water sport activities. Please note that the jet skis are not included in the ticket price. A beautiful lunch is served on board before heading to the Isle of Lobos where you will enjoy 1 hour 45 minutes on the island and then you can soak up the stunning views on the journey back to Corralejo. The tour finishes at approximately 16:30. On occasions the days of operation may change, in this situation a day as close as possible to your original preferred date will be offered, should this not be acceptable a full refund will be given. Experience one of the most popular excursions in Fuerteventura, gain an insight into Canarian life and see some of the most famous sites on this guided tour. You will be picked up from your resort and will head to Caleta de Fuste, please note that further passengers will be picked up on route. From Caleta the tour continues South, going past Las Salinas del Carmen and to Jandia where you will be able to enjoy 20 minutes free time. From Jandía the tour heads North and stops at Pájara which has a stunning church with Aztec façade. After Pájara you move on to Betancuria and enjoy lunch on route. This is followed by a visit to the brilliant Aloe Vera factory in Tiscamanita before travelling North through Tindaya and La Oliva. Make sure you take in the stunning views over La Casa de Los Coroneles along the way. At the end of the excursion you’ll be returned to your resort. This incredible water park in Corralejo has an impressive surface area of around 25,000 m2! Acua Water Park has 15 attractions for all ages and for the whole family to enjoy. Experience the wave pool, the splash race, the Kamikaze and the dedicated kids area. Ride the slides, play in the wave pool or relax in the Jacuzzis. You can also sunbathe on the free sunbeds or simply enjoy watching your children play in the kids area. The park has a kids club where little ones can be entertained playing board board games, colouring and having their faces painted whilst their parents enjoy the slides and rides. There is a self-service restaurant in the park and free transport is provided from selected resorts. There are payable lockers, a photo shop, a pool bar and a souvenir shop. The park is located Avda. Nuestra Senora del Carmen, No 41, 35660, Corralejo, Fuerteventura, Spain. This guided tour is a visit to Fuerteventura’s closest island, Lobos. Expect fun in the sea and sun! Once collected from your resort you will be taken to the port at Corralejo where you will board the luxurious Freebird catamaran. Whilst on route to the paradise island of Lobos you will search for dolphins and whales which are often seen in these waters. The captain will anchor at one of the beautiful beaches and you can use the snorkel equipment provided to explore the stunning water or you can swim or simply relax in the sun! A delicious lunch of pasta salad, Spanish omelette and tuna pies will be served and you can enjoy the free bar which includes water, juices, soft drinks, beer, wine and sangria. You will also be able to visit the Isla de Lobos. On occasions the days of operation may change, in this situation a day as close as possible to your original preferred date will be offered, should this not be acceptable a full refund will be given. Please note that the menu is subject to change. Experience a guided day trip to the stunning island of Lanzarote! Once you been collected from your resort you will be taken to the port of Corralejo where you will board the ferry to Playa Blanca in Lanzarote. You will then take a bus to Las Salinas del Janubio (salt flats) then move on to Yaiza and the Montañas del Fuego with a visit to the incredible National Park of Timanfaya. Here you willl experience a geothermal exhibition and take a tour of the Route of the Volcanoes. The bus then moves to the wine-producing area of the island called La Geria where you will visit a typical wine cellar. The last two destinations are Teguise and Los Jameos del Agua before returning to Playa Blanca for the ferry crossing back to Fuerteventura and you will then be returned to your resort. Please note that for this tour all passenger’s passport details are required upon booking. If these are not received they will not be able to take part in this tour. There is so much to see in Fuerteventura and another great way to experience it is to hire a car.